"Go West" Feral Woman: I think I be special in some people's books..err Blogs! I think I be special in some people's books..err Blogs! This word and its many definitions fits the concept of a blogger "sisterhood" perfectly, dont you think? After all, if you are a woman blogger or a reader of a women's blog on a consistent basis, you already know of the "sisterhood'! It never ceases to amaze me how I can visit many women writer blogspots and feel so much kindred spirit in such a short time. I can laugh with one blogger, reflect with another, and yet cry with another blogger's sadness. I can feel a "sister" blogger's joy, contentment, satisfaction, or angst, contempt, righteous anger, all without having to say a word; the written word IS powerful. With the photo journals that take place everyday in the blogger "sisterhood", we can visually sense her world, and what she sees directly; "a picture is worth a thousand words" so powerful indeed! And so it is the blogger "sisterhood' - Powerful. Knowledgeable. Versatile. 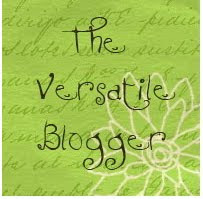 With that thought, I'd like to pass along the Versatile Bloggers Award too! Equus Villa & Riding Aside & Equus Girl Adventures Julie has such an amazing life that she needs not one but THREE blogs to keep us posted! With her honest writings on her Husband's health battle, her informative & fully loaded blog on riding "aside" (sidesaddle, something which I would love to learn!) and her story introduction to us readers of building a home & family over her beloved horses stalled below (Can you muck out stalls in pajamas without having to go outside? :D!) she takes us daily into her world and all its adventures. Thank you Julie for being a Versatile Blogger! Life at the Rough String gttyup's blog is what keeps me motivated to keep packing and move to Montana soon; her photography is the perfect photo journalism of living out west. Even though her horse filled adventures take place in Oregon rather then Montana, I can visually sense the special community of the west in her photo shots (and Montana keeps calling me to "hurry up, sell that house and get here!!"). Her writing style is like talking with your friendliest neighbor; I never feel like I'm eaves-dropping in on a conversation, instead its the easy "listening" of a good tale. And the bonus part is that she has streaming old timey cowboy music playing on her blogspot! So like the versatile breed of the Quarter Horse, gttyup's writing and photographic essays at "Life at the Rough String" is what makes it a truly versatile blog! Thank you gttyup for being a Versatile Blogger! 3. Pass this award along to bloggers who you have recently discovered and who you think are fantastic for whatever reason. 1. My first name is Janice. Almost rhymes with Venice. Or menace. Or lettuce...whichever is more feral. 2. My good nature is built in. Life's too wonderful even in the most worst circumstances. I'm kind of like a grateful black cat on the eighth life still waiting hopefully for a bowl of cream. 3. I once rode 17 different horses in one summer; catch rides, training, and clinics. I was younger, single...and nuts. 4. I cannot stand going to church functions that only involves church ladies. Too scary for me. But if I do go, I try to make the most of it. Thats scary for them. I tend to remember things I have read or seen, rather then heard. 7. I started writing about my life this year. these writings, stories, and photos are for my yet to be conceived grandchildren. 1. Thanks for visiting my blog. 2. Wishing you a speedy move to Montana. It's not Oregon :-( but it's part of the greater Northwest corner and therefore a wonderful place to live.